UPSC IES Prelims 2017 results have been declared today, on February 24, 2017. 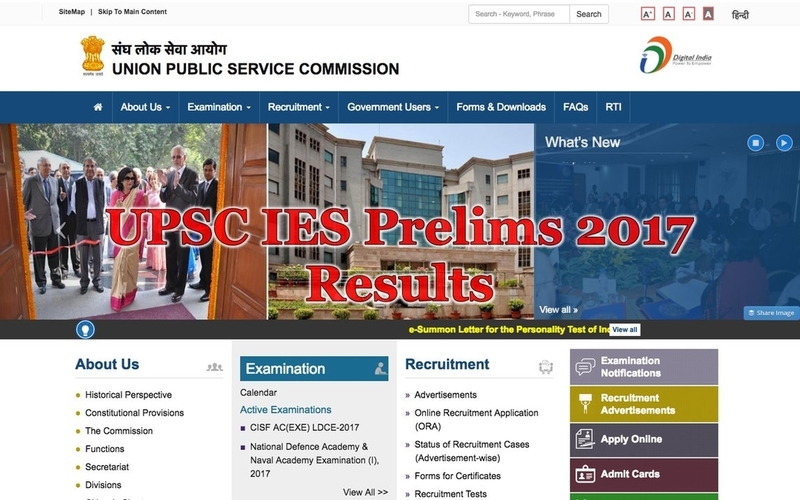 The Union Public Service Commission has declared the Indian Engineering Services, IES Prelim Examination 2017 results today, which can be accessed through the official website of UPSC. The UPSC IES Prelim Exam was held on January 8, 2017 at different test centres across the country. Roll numbers of the selected candidates have been mentioned in the UPSC IES Prelims 2017 results uploaded on the website. Candidates can check their UPSC Indian Engineering Services IES Prelims result 2017 here. Candidates must take a printout of the result for future reference. Civil, Mechanical, Electrical and Electronics and Telecom Engineering are the streams in which candidates will be tested in the UPSC Indian Engineering Services Mains 2017 exam, which will be held on May 14, 2017. UPSC Indian Engineering Services Prelims 2017 qualified candidates can only take part in the UPSC IES Mains 2017 examination. The admit cards for the UPSC IES Mains examination 2017 will be made available three weeks before the commencement of the examination on the website.